If your hard drive has a mechanical failure and you need to find a donor drive in order to transplant the platters, the heads, PCB board, disk motor or any other component that has gone faulty on it, we have created a short hard drive donor match guide to help you purchase the correct hard drive. 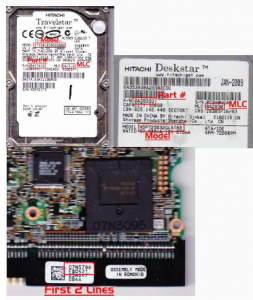 We have put together this rough guide together for educational purchases and to show how complicated it can sometimes be to source an identical match for a failed hard drive, whatever the brand ie Western Digital, Seagate, Toshiba, Hitachi, Maxtor, Samsung or Quantum. When a WD hard drive fails, in most cases of mechanical failures, the ROM chip on the PCB has to be swapped. 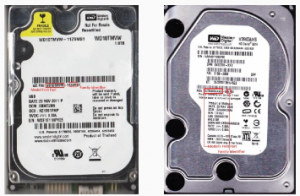 The first thing to look out for is the label on the hard drive where you will find a number of references including, serial number, capacity, firmware, part number and date. In order to find the correct PCB board, you need to match the second and third characters of the second part of the model number ie the characters after the dash. The model number always start with WD for example:WD1200BB-22FTA0. Finding the right references will increase your chances of a successful ROM chip or PCB transplant. If the head stack assembly has to be replaced, the references to look out for are the same from those mentioned above for the ROM chip. The second and third middle characters of the second part of the model number have to match. In addition, the country of manufacture has to match such as Philippines, Malaysia or Thailand. The DCM ie the Drive Configuration Matrix number is also important. The fifth character has to match but if you can also match the 4th, 5th, 6th and 7th characters, that’s an event better match. An example of a DCM number is HBNTJBBB. As for the date of manufacture, it has to be the closest as possible, preferably within three months of each other. 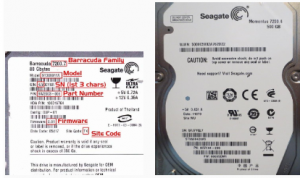 If your model is a Seagate Barracuda 7200.11/7200.12/5400.6, ES2, Momentus 5400.5/7200.3 and newer models, the full model number and the PCB number will be needed and the closest firmware available will increase the chances of a successful PCB swap without the need to swap the chip. Should your hard drive be a Seagate F3, a chip transfer will be needed in order to fix the drive. 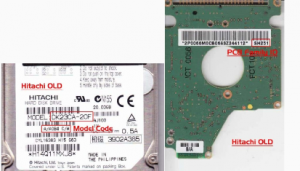 If your Seagate needs a head stack assembly or a platter swap, the chip transfer will be needed. References to look out for are the full model number, the site code, the full part number or at least the first three characters of the serial number and the firmware. 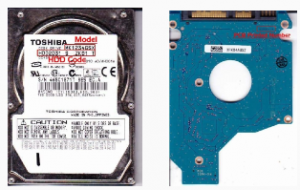 If your Toshiba hard drive requires a PCB board replacement, a chip transfer will be required. References to match when looking for a donor drive is the full model number, for example MK 1017GAP and PCB printed number, for example, B36021242013-A. In addition, the first six digits of the serial number, which includes the number and location of heads, are important. The full model number, HDD code and first six digits of the serial number have to match. In case of the HDD code, it has to be the closest as possible. If your Hitachi or your IBM hard drive needs a logic board replacement, the NV-RAM chip will have to be transferred. 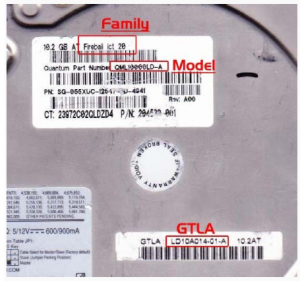 The criteria to look for in a donor drive are the full model number, for example IC25N040ATMR04-0, and the first two lines of the PCB references as found on the sticker, for example 0A71339 BA3293. If you need to replace the head stack or platter of your hard drive to recover your data, you need to transfer the ROM NV chip. The donor drive has to match the full model number IC25N04ATMR04-0, the part number, for example 0A30243 and the MLC number (Multi Level Cell where the data is stored), for example DA2010. If your older model of Toshiba needs a logic board replacement, mo chip transferred will be required. The full model number, for example HTS428140F9AT00, and the PCB family number is necessary, for example SH333. The Maxtor brand has been sold to Seagate in 2006. For new models of Maxtor, please check the Seagate website which will give you more information. 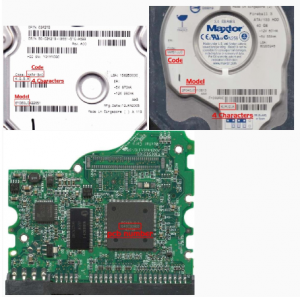 If you have to carry out a replacement logic board on a Maxtor hard drive, you need the full model number, such as AR160L00420P1, the code VAM51JJ0 and the controller version, for example 040116500, have to match. There will be no need for a chip transfer or any other replacement. 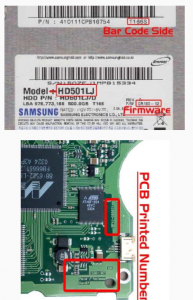 If your Samsung hard drive needs a PCB replacement, you will need to replace the chip for newer models. Information to look out for in a donor drive include the full model number HM120JI, the PCB imprinted number such as BF41-00133A and firmware for example HH100-10. The matching criteria for Quantum hard drives varies greatly but you can try to match the model, for example Quantum Fireball CR, Quantum Ict 20 or Quantum Plus LM and GTLA such as 6LM15A014-01-A15.0AT. In 2000, Quantum was sold to Maxtor so you need to check Maxtor criteria for hard drives made after 2000. Please note that interacting with your failed hard drive and attempting physical, electrical or logical repair, may result in permanent damage to the hard drive making data loss impossible to revert. Creative IT cannot be held liable if any of your actions have resulted in permanent data loss or financial loss due to damage done to the drive. Whatever attempt, including transplanting parts from a donor drive to your failed drive, is at your own risk. If your data is important to you, we suggest contacting our data recovery services, instead of trying to repair the hard drive yourself. All information given above does not guarantee any results and is intended for educational purposes only. There are often exceptions to hard drive donor matching and you always need to contact a professional before purchasing a donor drive.